The international main poster art of Columbia Pictures' new, edge-of-your-seat thriller “The Shallows” starring Blake Lively has been released by the studio, ominously showing the dangers that await star Blake Lively. 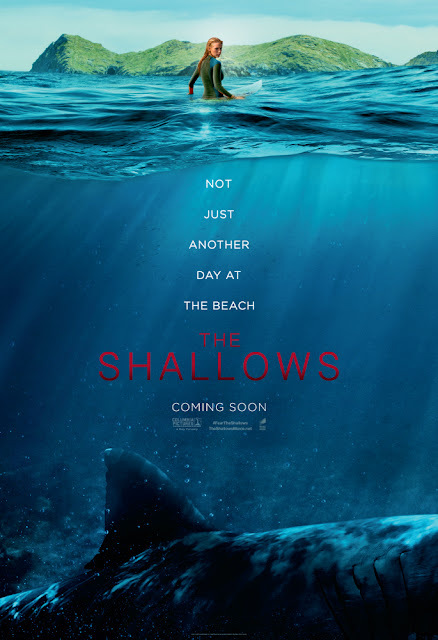 In the taut thriller “The Shallows,” Nancy Adams (Lively) is surfing on a secluded beach when she finds herself in the feeding ground of a great white shark. Though she is stranded only two hundred yards from shore, survival proves to be the ultimate test of wills, requiring all of Nancy’s ingenuity, resourcefulness, and fortitude. The film is directed by Jaume Collet-Serra (“Unknown,” “Non-Stop”) from a screenplay by Anthony Jaswinski (“Vanishing on 7th Street”), and produced by Lynn Harris (“Blade: Trinity”) and Matti Leshem. Executive Producers are Doug Merrifield (“Pirates of the Caribbean: At World's End”) and Jaume Collet-Serra.